Over 1,270 species native to the United States are listed as at-risk under the Endangered Species Act, which include such iconic creatures as the grizzly bear and the California condor. In their recent report, the National Wildlife Federation, American Fisheries Society and the Wildlife Society argued that the actual number of at-risk species is significantly higher. The difference in numbers is accounted for by the data source. While federal authorities document species on a case-by-case basis, the report relies on data from NatureServe, which determines the health of any particular species on a sliding scale. Some kinds of animals have fared worse than others. 40% of all freshwater fish in the United States are now endangered or at-risk while amphibian populations shrink within their known territory by 4% each year. “This loss of wildlife has been sneaking up on us but is now like a big tsunami that is going to hit us,” Thomas Lovejoy, a biologist at George Mason University who advised the report, told the Guardian. Species decline can be attributed to a variety of factors, including habitat loss, increased spread of disease, climate change, and pesticide use. The report emphasizes the need for a federal response to deal with this crisis, citing successful examples of species recovery efforts throughout the United States. 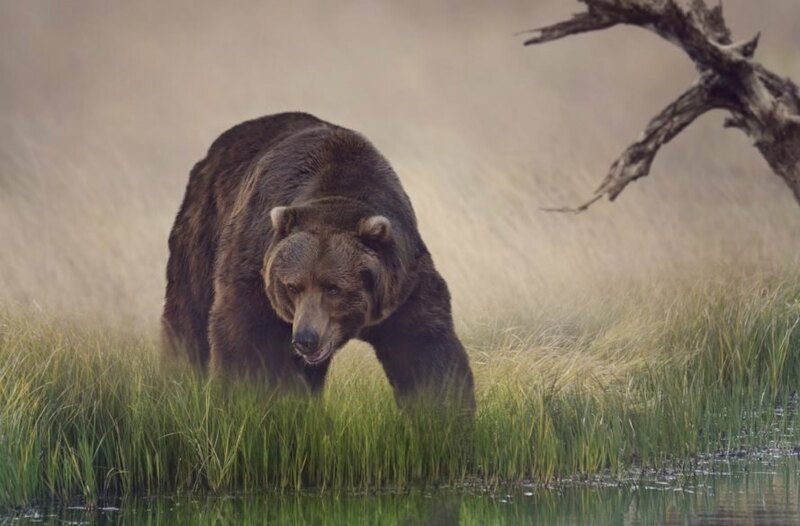 A grizzly bear scours a pond for potential food. A California Condor in Zion National Park.